Tuesday marked two weeks since the former campus of Lakeview Elementary School became an Oakland Unified School District (OUSD) administrative hub. Lakeview was one of five elementary schools the district decided to close after the end of the 2011-2012 school year, despite protests from the community. The campus is now home to OUSD’s Family, Schools, and Community Partnerships (FSCP) department, which was previously scattered among four locations. One of the first services the site began providing was enrollment, which attracted a crowd of parents Tuesday morning. The opening of the campus as an administrative center came only a few months after a tent city was established on the Lakeview campus to protest the closure of the school. The camp lasted for a little over two weeks before OUSD police evicted the encampment in early July; on that same day, protestors marched to the home of school district superintendent Tony Smith, calling for him to re-open the school or resign. 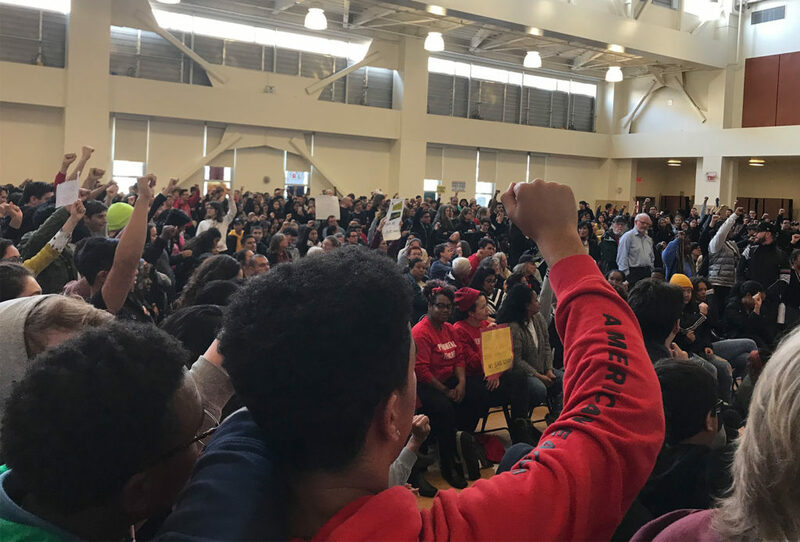 Lakeview protestors later urged the Alameda Central Labor Council to sanction a picket line to prevent district administrators from entering the school, but none was authorized. The front entrance to the school was gated and a chalk message in support of Lakeview protestors was visible on the stairway. On Tuesday morning the front entrance of the school remained gated and print-outs with arrows directed all vehicle and foot traffic up the roadway entrance off Grand Avenue to the parking lot. Parents enrolling students in grades K-12 stood in a line underneath white tents, waiting to get inside the portable building unit designated as the new Student Assignment Center. Meanwhile, two large Nor-Cal Moving Services trucks sat just outside the parking lot, as workers unloaded cargo and transported boxes and furniture into the main school building. The district’s enrollment center and the Transitional Students and Families Services department, which assists migrant, homeless and refugee students as well as those from families seeking asylum, opened first on August 14. Other FSCP departments began relocating shortly thereafter, including Translation Services, which helps bilingual families with everything from enrollment to school site parent meetings and Individualized Education Plans for special needs students. Other FSCP departments include Family Engagement, which handles volunteerism and community building; Health Services, which supports the school-based nursing staff; and Social and Emotional Learning, a new district program which will focus on teaching students to manage emotions, relationships and decision-making in a positive manner. 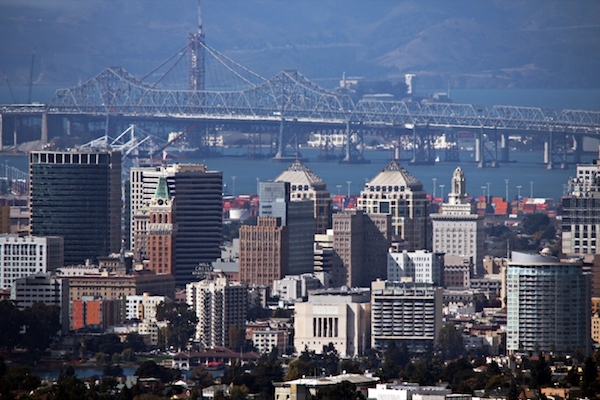 Previously, FSCP staff had been working out of four separate locations throughout East and West Oakland, which are now consolidated at the Lakeview office. “If you’re a family and you have a 4-year-old and 6-year-old and you need to have one in preschool and one in elementary school, and you’re homeless, you’ll have everything in one place to get your needs taken care of,” said FSCP associate superintendent Curtiss Sarikey. Sarikey said all of the departments are expected to finish moving in this week, with the exception of Health Services, which will complete its move in September, bringing the number of in-house staff to about 100. On the first floor of the main school building in a former kindergarten classroom, Kiko Garcia worked with parents enrolling preschoolers. Garcia is a preschool teacher who has assisted with the district’s Pre-K enrollment for the past three years. The previous location at 495 Jones Avenue was “just a big room,” he said. “[This] office is much bigger, there is more light.” Access to parking was another improvement, he added. Dalila Sanchez enrolled her son Fernando in preschool for the first time. “It’s very convenient,” she said of the Pre-K office. Enrollment secretary Jackie Stallworth assisted parent Kimberly Foster with preschool enrollment. She added that the warm weather has been another source of “frustration and physical stress for staff and parents,” so district workers began providing water on Tuesday for parents waiting in line outside. “We’re doing the best we can,” she said. Andrea Bustamante, director of community school partnerships, was guiding movers as they transported items to and from the school’s auditorium, which is currently serving as a staging area for chairs, desks and boxes destined for offices. Bustamante says the auditorium will be later used as a community space for large events like professional development workshops for afterschool program staff or collaborative meetings with families. She said that they’ve preserved the school’s artwork, like the auditorium’s “Lakeview Leopards” mural, and hope to place more art from local schools and programs, as well as pictures of students and families, around the building. Read Oakland North’s complete coverage of Lakeview Elementary School. On Tuesday, the former Lakeview Elementary auditorium served as a staging area for items in transit. In the future it will serve as a community space for FSCP events. Thank you Oakland North for finally covering OUSD’s side of the equation. Your previous attempts were minimal in this regards and appeared one sided. At the same time, this is the best detailed explanation OUSD has given for why they are using Lakeview. Why didn’t they work harder to get the word out earlier? On the cost side of the equation, what is the cost savings of consolidating FSCP? How is OUSD compensating for the increased difficulty in outreach, especially for poor families? Weighing the cost savings vs. the decreased outreach shows the challenges that a large, urban school district must balance. Not easy. It’s why OUSD needs more volunteers, esp. retired people looking to “give back”. After nearly 100 years of educating our children in our community, Lakeview is now a parking lot for administrators. Jody London and her board gave the reason of declining enrollment and not enough money for closing Lakeview and 4 other elementary schools. Now what we see is this year we have lost another 900 children due to the ensuing chaos from the school closures and this schoold board’s failed policies. We have a real opportunity to make some possitive changes for our children this November 6th with the election of Thearse Pecot in District One and Mike Huchison in District 5.
you are welcome to come by and see what really happens in the district office of family community partnerships. it is much more than a parking lot, the services are a vital resource to the community and families we serve.